Working as a team, artists Connie Omans and her granddaughter, Tara Beaton, fashion wonderful pieces of wearable jewelry art from just about anything—found objects, old items friends give to them, stones, pearls and more. “In our business, The Plain Jayne, we recycle and reconstitute all types of items,” Beaton explains. “My gram gets some amazing finds at thrift stores; for me, the sky’s the limit [when I work] with rocks and crystals.” Omans, on the other hand, loves working with beads and pearls. 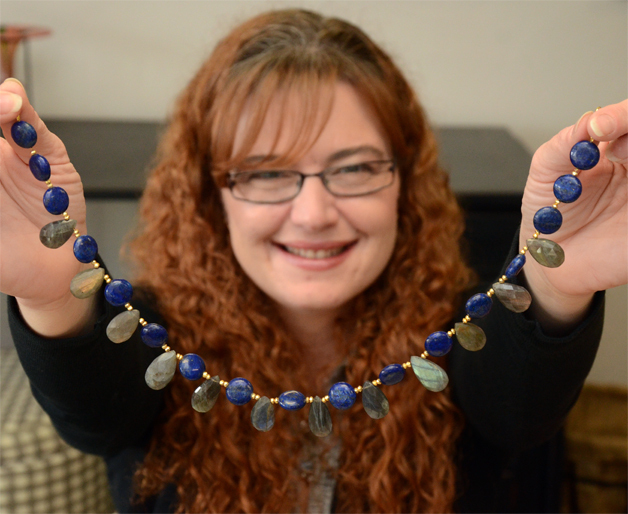 “I just love knotting and stringing different beads,” she says. Besides being an accomplished jewelry designer and craftswoman, Omans has also carved stone, worked in clay and now paints. Her passion for the arts expands to performing, too. A Screen Actors Guild member, Omans has even appeared as an extra in several major television shows such as The Mentalist and Big Love. Beaton, who currently lives near Colfax, recalls a fulfilling childhood with all types of art supplies available in her grandmother’s home. “My mom and I loved living with Grandma—we had tons of farm animals, cats and dogs. [She] was a real hoot to grow up with,” Beaton admits. “She is an incredible problem solver.” The pair shared a normal grandparent-grandchild relationship with the usual generational differences, until two unexpected tragedies struck. Making jewelry and art has endured as a huge part of their relationship and really bolstered both of them in the healing process. It was Omans who taught Beaton how to string beads; however, Beaton soon tired of stringing and realized that metal wire was her medium of choice. Whether creating side by side or solo, they seem to constantly be mentally connected. While working together, they may get inspiration from a special stone, vintage carving or other materials. Just as the old saying goes, “one man’s junk is another’s treasure,” these two are able to reuse and combine older pieces of broken or unwanted items into new, dramatic designs. They never incorporate cheap glass or plastic; it is always something organic and precious. Natural pearls, semi-precious stones, crystals, rough rock, copper, silver, gold, Swarovski crystals, blown-glass beads and more are fashioned to enhance other elements in a necklace, bracelet, earrings or a natural piece of stone. Every design is unique and handmade. “God made them as one of a kind,” Omans explains. Keeping to their mutual love of animals, they’ll both be participating in Art & Brew, an art show at Roseville Brewing Company on April 26. Portions of sales will go directly to Placer SPCA—helping to support local homeless animals needing love and forever homes. For more information, visit theplainjayne.com.